Programming with DynamoDB – Level 3 is for anyone who want to explore the world of NoSQL databases & dig deeper into DynamoDB which is a NoSQL database offering from Amazon Web Services. It will help you understand fundamental concepts of DynamoDB Architecture, designing the database for specific use cases & performing database activities along with hands on exercises to strengthen the concepts. DynamoDB is a key-pair type NoSQL database which is fully managed & highly scalable. It can give you desired read / write rate consistently regardless of the size of database. Why learn about programming with DynamoDB? NoSQL is gaining lot of momentum in today’s world where data is growing at very fast rate. DynamoDB provides you a highly scalable system for your NoSQL needs. If you are already a DBA & want to expand your skillsets beyond traditional database technologies into cloud-based systems. If you are just a technology enthusiast who wants to know more about one of fastest the growing offering in the domain of cloud computing then this is the right course for you. If you are evaluating different database technologies to decide one for your application. If you are already using another NoSQL database but want to migrate to a solution that doesn’t involve pain of managing a database. This course will be handled by experienced trainers who not only have immense knowledge but also a lot of practical exposure to the subject being taught. Understanding consistency models for Reading / Writing to table. This is NOT a beginners AWS class. Should have prior experience with AWS in necessary. Bhavesh Goswami the Co-Founder & CEO of CloudThat Technologies, is a leading expert in Cloud Computing space with over a decade of experience. He was in the initial development team of Amazon Simple Storage Service (S3) at Amazon Web Services (AWS) in Seattle. He honed his Cloud Computing skills at Amazon where he helped ship the first version of S3 in 2006. Later he moved to Microsoft after over three years at Amazon to take up the challenge to help manage Cosmos, the Cloud storage and Big Data computational engine that powers all of the Microsoft’s Online Services, including Bing. After living in the USA for over 10 years, he came to India in search of a challenge and Co-Founded CloudThat Technologies. He has personally trained over thousands of people on various Cloud technologies like AWS, Microsoft Azure, Google App Engine and more since early 2012. Bhavesh has spoken at various Cloud and Big Data conferences and events like ‘7th Cloud Computing & Big Data’ and have been the Key Note Speaker at ‘International Conference on Computer Communication and Informatics’. He has authored numerous research papers and patents in various fields. 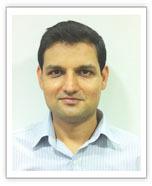 He is passionate about technology and keeps the company up to date on latest Cloud technologies & market trends. Participants will need to purchase the certificate exam voucher separately if they want to get certified by AWS. Programming with DynamoDB - Level 3 is for anyone who want to explore the world of NoSQL databases & dig deeper into DynamoDB which is a NoSQL database offering from Amazon Web Services.